Today we are going to take it easy, no excavations or museums and after a homemade breakfast we first take a walk through the village and the surroundings. 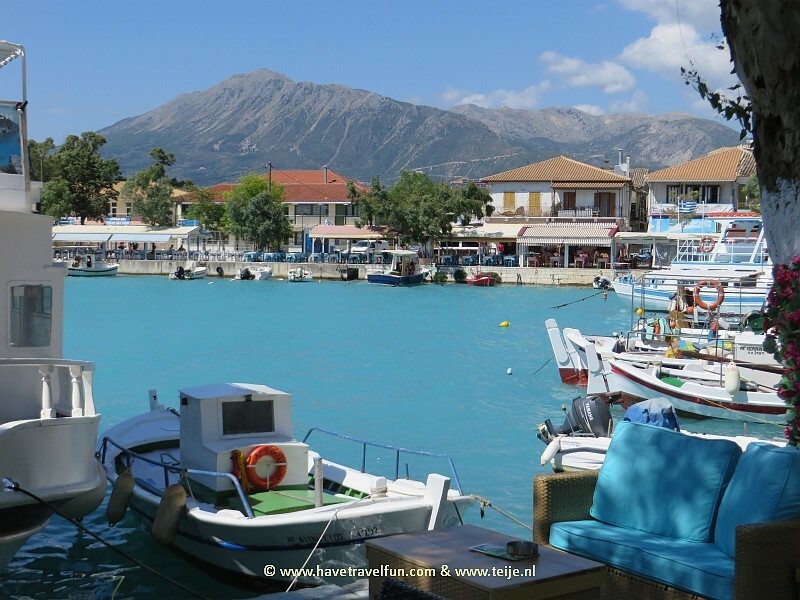 Kalamos is a small hamlet along the coast and our apartment is only 50 meters from the sea. There is a narrow beach that consists mainly of thick stones, not really nice to put your towel on or walk into the sea. We will later look for a more suitable beach. Here and there houses are scattered and most of them seem to be for renting out. Our apartment is on the last piece of paved road, further onb they are all sandy paths. Besides some houses, it is mainly olive groves that adorn the landscape and we see them in all shapes and sizes, from young and thin trunks to knotty old trees. Olive trees grow very erratic so you get special shapes and also the wood has beautiful veins when you cut the trees. But there are strict laws for cutting down olive trees in Greece and the tree is also a lot more valuable as a supplier of olives and olive oil than for wood. Because of the erratic growth and the fact that only the short stem is thick, you can not really make big objects of it, let alone boards. We roam extensively around the olive groves behind the village, and there are many more houses than we expected. Yet we see very few people and also not many tourists. The holiday season really starts on July 1st, at least most of the prices of apartments will then go up, sometimes as much as 50%. Kalamos is a very hidden village, there is only one road in and out and the roads to it and those in the village are not very good. Along the boulevard I find it even scary with the car, so narrow is it and you drive directly along the meter high quay so you must not cross the edge with your wheels. After our walk we drive to Argalasti, a somewhat larger village on a plateau at 200 meters altitude. It is a cozy village and in the travel guides we read that you have to pay attention to the buildings because there are processed stones from the Byzantine period used in them. It is a nice village to take a walk and of course we also try out a terrace. And there are some shops here so we can do some shopping. It is a pity in these kind of villages that cars are allowed everywhere, also on the central square. With a car-free center, these kind of villages would be even more pleasant. Then we make a short trip to the east side of the peninsula. Short in terms of kilometers but you do not make much progress on the winding roads, 30 to 50 kilometers is the most we get per hour and later we find out that this applies to the entire peninsula. We drive through the hills covered with bushes and low trees, it is green everywhere. On the east coast we find a nice beach at Paltsi but not such a beautiful sandy beach as we are used to. Only now we read in our travel guides that the beaches on the west coast of the peninsula are rather rocky and that the better ones are on the east coast. Fortunately, we have a car. At the end of the afternoon we find a restaurant in the village and take a salad. But even here we get a free dessert afterwards but it is a very nice one this time: strawberries, served on ice cubes. Today we drive south along the coast. The peninsula has the shape of a curved finger and the curvature is located in the southwest. We come through several small villages where there is not much to do. There are many houses for rent but it seems that in this part many houses have been bought by brokers and companies that in this way want to get the whole rental business into their hands and therefore can count higher prices. The landscape remains incredibly green, the trees grow up to the rocky coast. There are indeed few beaches on this side and most are also quite rocky. But sometimes we see beautiful pictures like these houses on a peninsula near Tzasteni. The white of the houses with the red roofs contrast beautifully with the blue sea and sky. When we almost reach the end of the peninsula we want to drive a circle via the south side, but we get stuck on a parking lot near Agia Kyriaki. The continuing road becomes a narrow sandy path along the coast and does not look good. I advise against taking it. So we drive the curvature of the peninsula along the north side. In this area there are fewer roads and via Trikeri we arrive at Agia Kyriaki. In Trikeri the women inherit land and houses because (at least in the past) all men are seamen and inheritance via the female line is therefore more logical as sailors often did not return from the sea. But probably now more people, including men, will be active in tourism. Agia Kyriaki is a village with many namesakes, there are hundreds of villages in Greece with that name. We search for a restaurant along the harbor and Teije can once again practice his Greek, because here too we end up at a traditional Greek tavern. A little further away is a Dutch couple that is here with the boat, but the boat is for sale and they try to make a buyer enthusiastic. That would be nothing for me, a holiday on a boit, although of course you can more easily find quiet beaches. When we leave, Teije asks the boss whether we can also take the car through the village to the other side and thus arrive at the sandy path near the parking lot where we have previously turned. He looks at our car, a pretty wide Volvo and nods: it should just be possible. And in the first corner of the village, a Greek comes running toward us and gives instructions. It is a difficult turn but in the end we drive, with the mirrors almost against the walls of the houses, through the narrow streets of the village where traffic from both sides is allowed. Fortunately, we do not meet anyone! I would never drive such a road, although Teije seems to love them and seek them out. In the evening we eat again in the restaurant of Yannis' son and while Teije gets Greek lessons from Yannis after dinner, I walk to his son, the cook, to ask him if he might have something special for Teije, because it is his birthday today. It takes a while and I have no idea if he understands what I mean, but at some point Yannis writes a few lines in Greek that Teije has to translate. Then I hear him say something amazed in Greek: the last sentence he had to translate was: I am celebrating my birthday. Funny, he calls, it really happens to be my birthday. And then the son of Yannis comes with a kind of cake and a bottle of champagne. Ha, I got you, since he does not like to do something about his birthday. The cake is very sweet and with some difficulty we eat a small part of it with the excuse that we are still full of dinner, and so we take the rest to the room. The family also thinks it is a wonderful joke, but we have to pay for the bottle of champagne, even when I didn't ask for it.